When it comes to First Fridays in Lancaster, I usually tout nontraditional galleries like the Infantree and Progressive Galleries. This month, I’m calling you over to the east side of the city, to the city’s most traditional visual arts space, the Lancaster Museum of Art, on the edge of Musser Park. 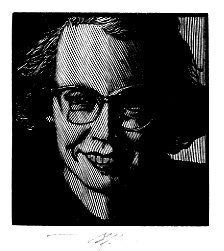 LMA is holding an opening reception tomorrow evening for two new exhibits, one of which is “Portraits of Illustrious Persons” by illustrator Barry Moser. I’m thankful to the museum’s director, Stanley Grand, and curator Heather Heilman Loercher for agreeing to let me in today for a sneak peak as they finished hanging the work. 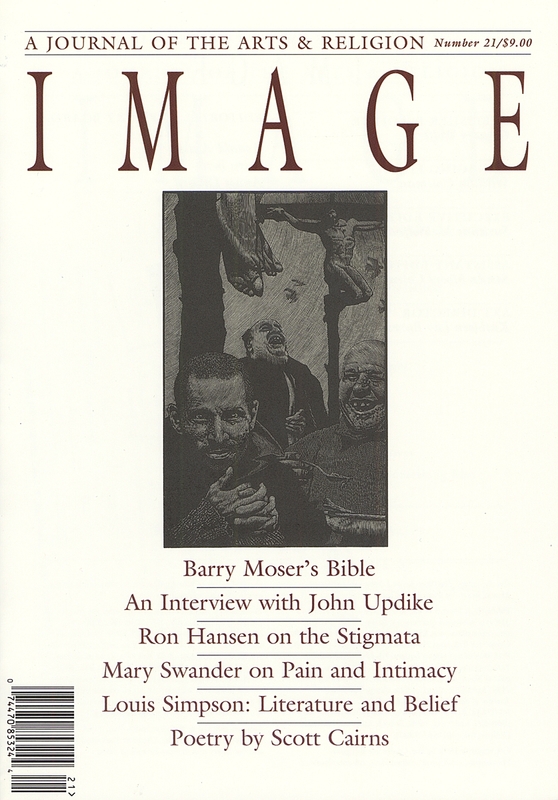 I first learned of Moser and his work through Image journal, a quarterly that explores the intersection of faith and art. He was featured on the cover of the fall 1998 issue, shortly after his Pennyroyal Caxton Bible was published, and this past December he was featured as Artist of the Month on the Image website. I came to know Moser’s work a bit better when I picked up Intruding Upon the Timeless: Meditations on Art, Faith and Mystery, a project completed by Lancaster city’s own Ned Bustard, through his Square Halo imprint. The book is a collection of essays by Image‘s editor, Gregory Wolfe, and features engravings by Moser. Moser works primarily in wood engraving, though he usually uses synthetic resin blocks in place of wood. He takes on great, often magisterial works, and manages to lift them still higher and to tease out new meanings (or, in the case of his one hundred–plus illustrations for Alice’s Adventures in Wonderland, to make the work even more absurd). 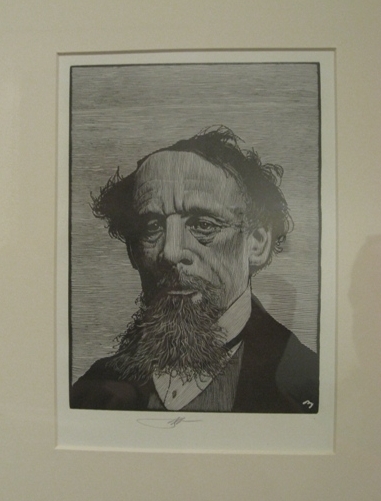 Over the past thirty-odd years, Moser has completed hundreds of portraits. The Lancaster Museum of Art acquired original prints of nearly all of them and has found the wall space to display most. Moser’s choices of subjects tell us a lot about what inspires him as an artist and earns his admiration as person. Moser’s treatment of the subjects reveals an artist with an extraordinary and sympathetic imagination. A glance at Moser’s carving of Joseph Conrad explains everything about the author who brought us Heart of Darkness and The Secret Sharer. Geoffrey Chaucer’s portrait is dominated by darkness, but for a small, blindingly white twinkle in his eye. After Moser’s Alice’s Adventures in Wonderland illustrations, his portrait of Lewis Caroll comes as a shock: a saddened man sits surrounded by negative space, seeking consolation in his own thoughts. Robert Frost’s grotesque, splotched face contrasts with his neat suit and tie and serene expression. You couldn’t capture him as a poet any better. I’m enamored by Moser’s self-portait, in which his face is lit from below, less like he’s telling a ghost story and more like he is illuminated by the light of his own work. A portrait that wasn’t hung when I visited is Maurice Sendak, which Dr. Grand told me the museum wasn’t expecting but was only too happy to receive. The Lancaster Museum of Art is on Lime Street between Orange and Chestnut, just up the street and across the street from the YWCA. The opening reception runs from 5 to 8 p.m. tomorrow, and I guarantee I’ll be making a long visit. If you can’t make it for the First Friday opening, the exhibit runs through May 24. And of course, there’s no time like the present to subscribe to Image.